Your dog has proven himself responsible enough to have in and out privileges, so it’s time to install a dog door. There are many benefits to having a dog door installed in your home: your dog is able to take potty breaks while you’re away at work, the likelihood of accidents is reduced, and you don’t have to keep getting up to open the door for your dog. Today’s dog door options have come a long way from the standard rubber flap covering a hole in the wall, and there are a few key points to consider when deciding on the right dog door for your home. Size: Dog doors are available in a few different sizes, depending on the size of your dog. If you have multiple dogs that will be using the door, choose one that will fit your largest dog. Security: If you have wild animal visitors to your yard, you’ll want a door that will keep them out. Large dog doors could potentially allow entry for human intruders as well. Many dog doors have locks but getting up to unlock it each time your dog needs to go out defeats the purpose of a dog door. Weather: Choose an energy efficient door to help save on your electricity bill if you live in an area with extreme weather. Type of installation: Dog doors can be installed in a wall, into a door, or in the gap of a sliding door. Available in 4 sizes, the PlexiDor is unique from most other dog doors in that it features saloon-style plexiglass panels. This heavy-duty door claims to be weatherproof and comes with a steel security plate to slide into place when you’re away for extended periods of time. All but the smallest size come with a key, so you can lock up each night. Choose from silver, white or bronze finishes to match with your home. This unique electronic pet door, that can be installed in doors or walls, works with your pet’s existing microchip or an RFID collar tag (one is included with purchase) for exclusivity: only those with permission are allowed back inside. The door requires 4 C batteries (not included) which should last about a year. The only down side about this door is that it only comes in one size, suitable for large cats and small dogs. Patio Pacific’s award-winning door claims to be the most energy efficient wall-mount dog door on the market. This insulated, highly durable dog door is available in 4 sizes, features solid framing, and comes with a locking cover. 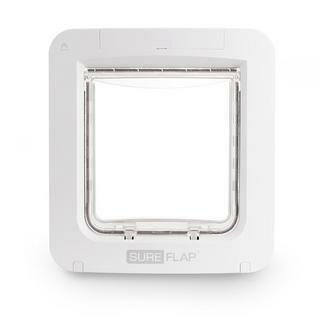 The double-flap door provides the most energy efficiency, but they make a single-flap model as well. There are strong magnets on the sides and bottom of the flap for a tight seal. Renters rejoice: this is a dog door option that doesn’t require cutting a hole in your wall or door. Available in 5 sizes, the easy-to-install PetSafe Freedom fits into the track of your sliding glass door. 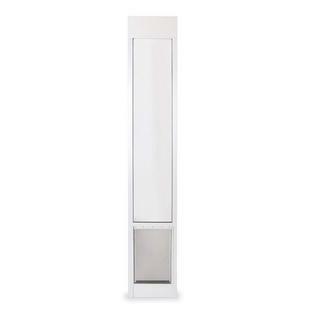 The product, available in white, satin and bronze, is weather resistant and is made with shatter-resistant glass. However, because the glass is single-paned and there is only one door flap, it may not be the best choice for locations that experience very cold weather. Ideal Pet’s dog door comes in four sizes and is built with two tinted flaps for energy efficiency. It’s equipped with fuzzy weather stripping to eliminate drafts and a strong magnet for secure closure. This door can be installed in a door or a wall, for which an extra wall kit is required. The included locking cover can be used on the inside or outside of the door. This is a great option for those who are seeking energy efficiency on a budget.